Are you tired of changing your floor design every now and then in an attempt to stay up to date? If yes, then you need to try the simple foyer medallion marble floor design as it has proved to be class, bold and ageless. With this one, you won’t need to do an upgrade any time soon because it combines the past, present and the future. Many homeowners have found it a worthwhile investment as it saves them the hassle of replacing their floors after one or two years. It also presents an elegant finish that gives even the oldest of spaces a lasting facelift. Many people will ask: How about its versatility? 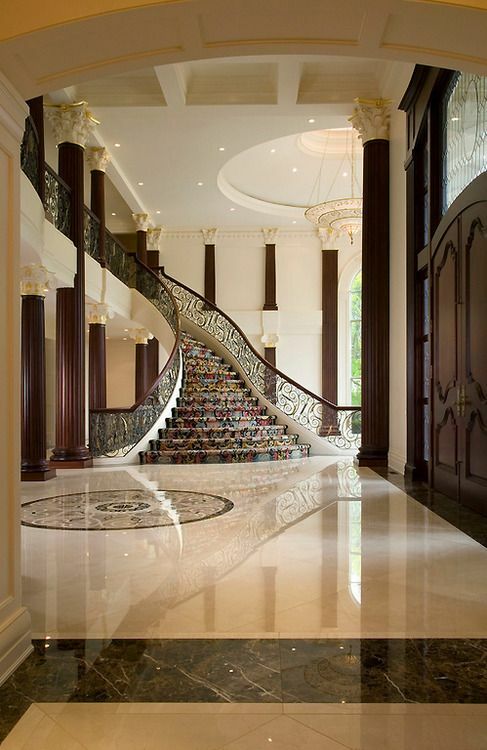 Does it mean that you can only use this simple foyer medallion marble floor design in the foyer? Well, the truth is that previously people thought it right to use it in the foyer, but there is absolutely nothing that stops you from using it in any other part of your house. In fact, modern interior designers have discovered ways to make this simple foyer medallion marble floor design useful in places such as bedrooms, sitting rooms, and bathrooms. It depends on your creativity and preference. Furthermore, this piece of art comes with simple patterns that are easy to work with. You can incorporate a variety of other interior decorations without distorting the main theme. Also notable about this foyer medallion floor design is the fact that it is made up of natural colors, namely; beige, light emperador, and brown. These colors are associated with warmth, peace and stability. You can therefore rest assured to have a touch of security, tranquility, and excitement in your house when you install the simple foyer medallion marble floor design. It sets the right mode the moment someone sets their foot into the house. Of course we all want to have that one décor element that takes the center stage in the house, and without doubt this simple foyer medallion marble floor design will surely create the right ambience for your house. Who can fail to notice such elaborate patterns and exceptional beauty? If you really want to make an impression with your interior, then you need to consider this simple foyer medallion marble floor design for your entryway and other core areas of your house. Let the beauty of this piece of art define your style, taste and preference. It is definitely a worthwhile investment. Posted 3 years, 10 months ago at 8:51 am.